Victor John Angelo "Vic" Raschi (March 28, 1919 – October 14, 1988) was a Major League Baseball pitcher. He was one of the top pitchers for the New York Yankees in the late 1940s and early 1950s, forming (with Allie Reynolds and Eddie Lopat) the "Big Three" of the Yankees' pitching staff. Later in his career, as a pitcher with the St. Louis Cardinals, he was responsible for allowing Hank Aaron's first career home run. Raschi was born in West Springfield, Massachusetts and went on to graduate from the College of William and Mary. Raschi's debut on the New York Yankees was on September 23, 1946, wearing uniform number 12. The next year he wore three different numbers (17, 19, and 43) but number 17 became his from then on during his Yankee career. From 1946 to 1953, Raschi won 120 games while losing 50. He led the American League in won/lost percentage with a .724 record in 1950, and in strikeouts with 164 in 1951. 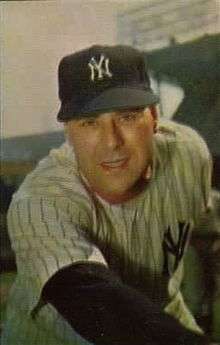 Raschi had a .184 career batting average, with seven runs batted in (RBI) in one game, an American League record for pitchers, on August 3, 1953. While playing with the Yankees, he and his wife Sally lived in a home in Hillsdale, New Jersey. On February 24, 1954, Yankee fans were surprised to see Raschi traded to the St. Louis Cardinals. In the remaining two years of his career, with the Cardinals and Kansas City Athletics (who signed him as a free agent on April 28, 1955 when the Cardinals released him), Raschi won only 12 games while losing 16. On April 23, 1954, while with the Cardinals, Raschi gave up the first of Hank Aaron's 755 career home runs. Aaron, Major League Baseball′s future home run king, had also notched his first career hit off Raschi eight days earlier. He kept his uniform number 17 on the Cardinals, but on the A's took number 16. Raschi retired to Geneseo, New York, where he ran a liquor store and served as a baseball coach at Geneseo State College (now the State University of New York at Geneseo). In 1975, the college dedicated the Victor J. Raschi Baseball Field, which is now used as a softball field. Raschi died in Groveland, New York. ↑ "Hank Aaron Career Home Runs". Baseball-Reference. Retrieved 2012-04-11. ↑ Gittleman, Sol. Reynolds, Raschi and Lopat: New York's Big Three and Great Yankee Dynasty of 1949–1953, p. 44. McFarland, 2007. ISBN 0-7864-3055-9. Accessed February 5, 2011. ↑ Gittleman, Sol. Reynolds, Raschi and Lopat: New York's Big Three and Great Yankee Dynasty of 1949–1953, p. 204. McFarland, 2007. ISBN 0-7864-3055-9. Accessed March 2, 2011.